Twice calling Congress "dysfunctional" at his weekly press conference Wednesday, Gov. Peter Shumlin said he's nevertheless relieved that the federal government managed to — at least temporarily — resolve its self-imposed fiscal impasse. "We're all breathing a sigh of relief that they got something done down there," he said. "It's a huge help to us as we try to put together a 2014 budget... There's more uncertainty ahead, but we're more certain than we were on New Year's Eve and that's a step in the right direction." Uncertainty over federal tax and spending laws has already delayed the Shumlin administration's own budget planning process. Secretary of Administration Jeb Spaulding said at a separate press briefing later Wednesday that the governor's annual budget address would be delayed until January 24, at which time the state expects to have a better sense of the impact of Congress' fiscal deal on state coffers. 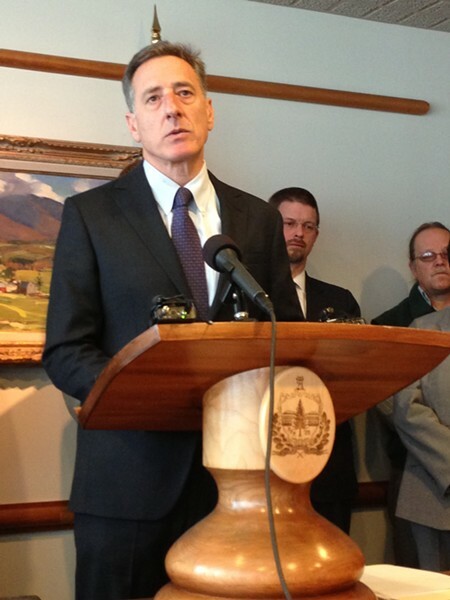 Shumlin says he's grown used to "managing around" a Congress he says leaves every decision to the last minute. "You know, this is a dysfunctional Congress. We saw it for the last two years. We're likely to see it for the next two. They seem to want to push the country to the brink every single time," he said. "I don't think Congress has met on New Year's Eve since the 1940s — or somewhere in that time period — when they were waging war against Korea. This is a dysfunctional Congress. We're stuck with them." Actually, Congress held New Year's votes in 1970. And, uh, wasn't that war in the 1940s against the Germans and Japanese? All that aside, Shumlin says he would have joined Sen. Patrick Leahy (D-Vt.), Sen. Bernie Sanders (I-Vt.) and Congressman Peter Welch (D-Vt) in voting for the compromise measure that passed Tuesday. "It's pretty clear that the dire consequences that would have been inflicted on the American economy had they not resolved this question would have been a real challenge for us," he said. "While it's not an ideal compromise, if I had been in the position of [Vermont's federal delegation], I would have done what they did and voted for it." Leahy, Sanders and Welch — all of whom were somewhat mum about the bill in the immediate wake of its passage — each elaborated on their 'yay' votes later Wednesday. Their take? It wasn't great, but it was necessary. "It is not the agreement that I or any one of us would have written on our own, but it does include several important provisions that will benefit every Vermonter, our nation's economy and the nation," Leahy said in a written statement. He pointed specifically to a year-long extension of long-term unemployment benefits, a permanent extension of lower tax rates for middle class families and a nine-month extension of the farm bill. "The agreement at least temporarily eases months of needless uncertainty," Leahy added. "This was a made-in-Congress crisis imposed on everyone by factional obstructionism in the House." Sanders agreed with the sentiment. "The 'fiscal cliff' agreement was not a 'good' piece of legislation, but not passing the bill would have been much worse," the independent senator said in a written statement. Sanders, who fought efforts to cut Social Security, Medicare and Medicaid benefits as part of the package, said he was pleased that entitlement programs — at least for now — were spared. "In addition to making sure most Americans do not see an increase in their income taxes, and that two million workers will continue to receive their unemployment compensation, this legislation defeats efforts to cut benefits for Social Security recipients and for disabled veterans," he said. "Despite an eleventh-hour bid by Senate Republicans, the final bill does not include their proposed change in how cost-of-living adjustments are calculated." In an interview Wednesday evening, Welch said, "It's far short of what we need, but it's a step, at least, in the right direction." Welch would have preferred a "grand bargain" along the lines of what President Obama attempted to negotiate with House Speaker John Boehner before Christmas, rather than the narrow agreement Congress ultimately reached, which will necessitate further showdowns in the near future. Welch said he was particularly disappointed that the deal raised taxes on families earning more than $450,000 a year — rather than using the $250,000 threshold President Obama and congressional Democrats have sought for years. "The part, for me, that was the most difficult was to accept that we weren't going to be able to get the revenues that the president campaigned on. I mean, how often has a president actually campaigned on the argument of raising taxes for the top two percent? He did and he won. The Romney voters in exit polls supported that," Welch said. "A lot of us believe this was our best shot of getting revenues to be a substantial contributor to a balanced outcome. A lot on the Democratic side felt a little disappointed in that." Disclosure: Paul Heintz worked as Peter Welch’s communications director from November 2008 to March 2011.